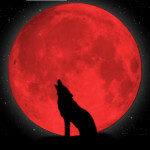 Did you see the red moon last night? One warm evening untold millennia ago, during the time when humans were only just beginning to assert their presence on this planet earth, the tribal elders of a tiny village in the land that would come to be known as Peru became terrified. They noticed for the first time that the rising moon was rapidly turning from its familiar brilliant gray-white appearance to the color of death—a deep dark red. It was the consensus of the elders that the gods must be severely unhappy with them and their small village. In an act of penance, they summoned a young virgin, who was quickly adorned in the finest of clothes, crowned with a wreath of blossoms and then flung to her death from the highest cliff. And by morning, the moon had returned to its normal hue. Phew. Since that memorable night, the elders and all those who have followed have selected countless young girls upon whom they have unilaterally bestowed the honor of saving the village from the wrath of the gods for doing whatever it is that keeps ticking them off. It has worked every time. The gods only know what would happen if they stopped.